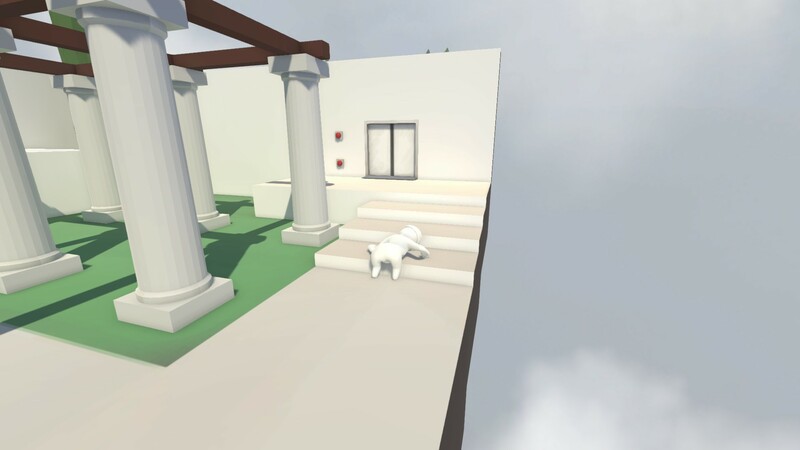 Puzzle platformers are not a genre I find myself playing often these days, but I’ve decided to take a break from my usual anime game fare to give Human Fall Flat a try. Since I enjoy games that make clever use of physics like Portal 2 and Quantum Conundrum, and I saw it had pretty positive reviews on Steam, I figured I didn’t have much to lose by giving this ago. Unfortunately, the “Fall Flat” part of the title accurately describes how I feel after a few hours of struggling through the gameplay. Allow me to explain. 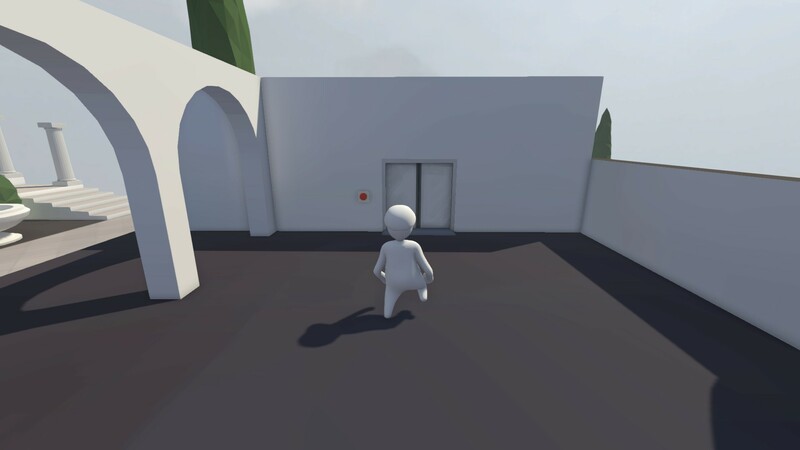 The sets in Human: Fall Flat are pretty plain. Human:Fall Flat has you play as a nondescript doughy “human” without any defining features, save for a baseball cap fused to your head. Your physique strongly resembles that of the Pillsbury Dough Boy, if he was a soulless lumpy mass with limbs who had no face. For some reason, the developers decided to make your character frustratingly difficult to control. In the early stages, you’re given tutorials when you pick up tapes that show you how to move, jump, grab objects, and climb to get around. Every single one of these actions is a chore to perform. When you try to grab something, you can reach forward, high, and low, and sometimes you won’t grab the object correctly, or when you do, it’s difficult to manipulate it how you want to. If I need to make a jump and grab a ledge, I need to do it just right or I’ll fall to my death and have to start over. Half of the time, this is what happens. 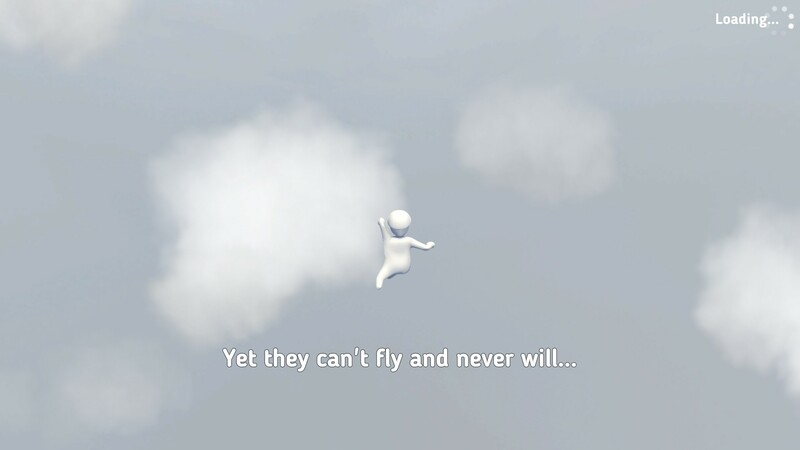 Oh, I’m not trying to fly here, I assure you. For instance, let’s say I want to use a long metal hook I found on the ground to knock aside a chained lamp that’s stuck on a rock above me. I try to take the hook to knock it aside so that it’ll move and freely swing in the air. Not only does the hook not move the lamp like I want to, I end up falling into nothingness multiple times before I get it right. And that isn’t the worst of it. Later in the game, you need to try to move a motorboat into the water to explore the level. The boat is practically impossible to move. There are rods in the sand that you’re meant to use to roll under the boat to shift it easier, but they don’t work all that well. After trying this twice for half an hour and having the boat rapidly fly off into the air and disappear, I wanted to drown myself in the water so I could escape this agonizing Sisyphean effort. But there is no escape, as the game cruelly points out to you in the beginning. You either somehow figure out how to get through the stages through trial and many, many errors, or you give up and play something that’s actually fun and functional. Hell, even Octodad wasn’t this broken, and it was funny and charming to boot. You can ragdoll at will. Doesn’t seem to serve much of a purpose, though. You want sound? There isn’t much here. Music is practically nonexistent. 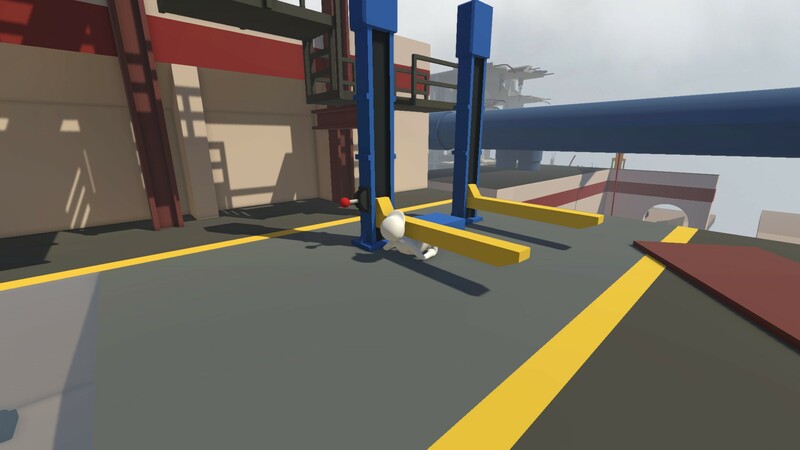 The world of Human Fall Flat has sound effects, and that’s mostly it. The graphics are nothing to write home about, either. I can tell what things are and how to use them, and I guess that’s really all you need in a game like this. The controls are abysmal on an Xbox 360 gamepad. My character moves like a bloated drunk after a Boston St. Patrick’s Day party. And the drunken movement honestly makes me nauseous. I was secretly hoping this machine would crush me and end the game quicker. I can’t understand for the life of me why this game has “very positive” review scores on Steam. For $15 you get maybe 2-3 hours of gameplay, depending on how good you are and whether you haven’t given up and uninstalled this yet. You would be much better off spending a bit more and getting Portal 2 instead, if physics and puzzle solving are what you want. Save yourself a broken controller and a sick bag and avoid this. The only good thing I have to say about it is that it’s (barely) functional, so take the small victories you get from getting past obstacles when you can.